Thanks for stopping by to find out What’s Happening in Middle Ga. This Weekend on and off the beaten path. This week’s edition of What’s Happening is for the weekend of April 3-5 which is Easter weekend! There is a LOT going on, even for Easter weekend. 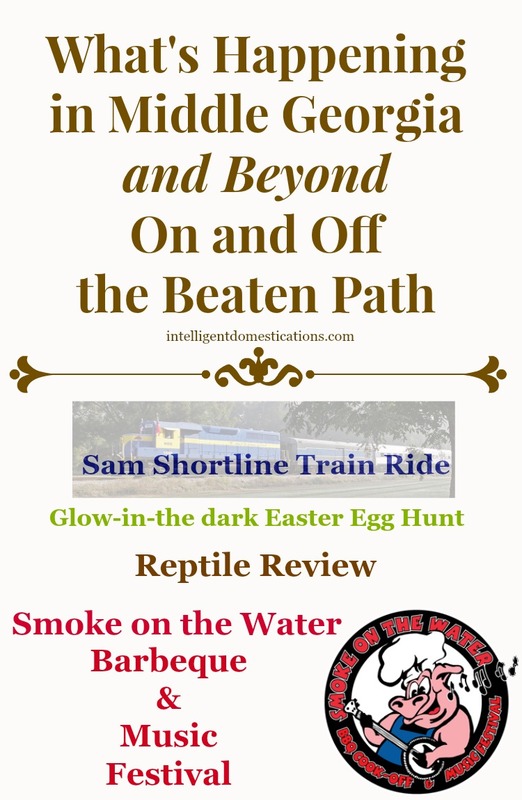 How about a Glow-in-the-dark Easter egg hunt or the Reptile Review at FDR State park. You won’t wan to miss the Smoke on the Water BBQ & Music Festival in Thomaston! Americus Explorer Train Ride on the Sam Shortline. April 4 & 25th. Riding in air-conditioned, 1949 vintage train cars, you can travel from Cordele to visit Historic Downtown Americus and tour Habitat for Humanity’s Global Village (Admission applies. Call 229-410-7937 for group reservations and rates). Easter “Egg”stravaganza at Veterans State Park. Sat. April 4th 10-11 am. Special Guest appearance by the Easter Bunny. All kinds of delicious candy will be on hand. Come out and see just how many Eggs you can get. There will be over 4,000 eggs to pick from. $1 per child. $5 parking Go HERE for more info. Glow-In-The-Dark Easter Egg Hunt at High Falls State Park. Sat. April 4th 7-9 pm.. More information Here. $3 per child. $5 parking. Full Moon Hike at High Falls State Park. April 3, 6:30-8pm. Admission $5, Parking $5. Junior Ranger Day Camp at High Falls State Park. Wed. April 8, 10am-3pm. Go HERE to make reservations. $15 per child, discount for multiple children. Story of Wool at Jarrell Plantation. Sat. April 11. 10:30-3:30 From “sheep to shawl.” Includes hands-on activities. Fired Works at Macon’s Central City Park April 11-19. Featuring 65 potters from Georgia and the Southeast. $5 admission. Reptile Review at F.D. Roosevelt State Park. April 4, 11 & 25. Times are 11am- 12pm Learn how to ID local snakes, turtles, and lizards Meet at the CCC Stone Amphitheater next to the Park Office. Admission $3 for ages 4 & up. Parking $5. Smoke on the Water Bbq and Music Festival at Bickley’s Lake in Thomaston. April 3-4th. Destination America will be filming BBQ Pit Wars. Entertainment includes Joe Diffie and Colt Ford. 27th Annual Dogwood Festival. Perry April 11 & 12th. See It Grow Clinic at Lowe’s. Go HERE to register, classes fill up fast for these Free events. April 11. Touch a Truck in Macon. April 18th 10am-2pm at Northway Church parking lot on Zebulon Rd. $5. Children under 1 are free. Strawberry Festival at The Rock Ranch April 25. Barnesville. 10am-4pm. $12 admission for ages 4 and up. Vidalia Onion Festival April 23-26 on Airport Rd. in Vidalia, Ga. Visit their Facebook page. Named one of the Top 5 Events Not to miss in the U. S. by MSNBC. Biking Bleckley. May 2. Cochran. Register HERE. 7:30am Check-In. 15 Mile ~30 Mile~50 Mile~62.5 Mile Metric Ride. Pickers in the Park Sat. May 3 8am-5pm. Crisp Regional Park in Cordele. Musician list HERE South Georgia’s largest outdoor yard sale and crafts fair. Massee Lane Gardens Free Admission Day . May 9. 10am-4:30pm. Free Admission Day. 100 Massee Lane, Ft. Valley, Georgia. American Frontier Days April 11 & 12. Music & Dancing on the Mountain. April 11 and June 20. Wildflowers & Wildlife Discovery Table April 12, 19 & 26 from 11 am-2 pm. Pine Mountain Trail Workday April 18, May 16, June 20, July 25 & Aug. 22. Times are 10am-3pm. Volunteer. Help Restore the Power House April 11 & April 26. Volunteer opportunity. Canoeing 101: Intro to Paddling. April 12, 9am-11am. $$10 includes canoe, PFD, and paddle. Twlight Night Paddle. April 18, 6:30pm-8pm. $15 includes gear. Kayak/Canoe Tour of Lake Blackshear. April 11 & 25th 3pm-5pm. $8 per person. Smores & More April 11 & 25th 7-8pm $2 per person. Sounds like there is a lot of events this past weekend. Thanks for linking up at the #HomeMattersParty linky this week can’t wait to see what you link up next week. Wow! There are a lot of fun things to do. I’d like the hike and the wool history hands on class!